The sleek flat style of our Lips Intensive Repair container won’t roll away and get lost, absorbs and repairs dry cracked skin fast and doesn’t leave a waxy residue on your lips. Last 10 x’s longer leaving your lips soft all day. This little tube is a total all-in-one first aid kit. 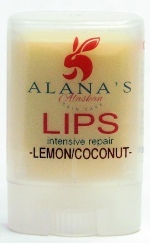 NO LANOLIN in our balms! That mini lotion bar saved me! It was so dry on the flight and in Denver that everything stung and hurt all the time. My lips and hands were so dry it was painful! I could hardly sleep because my throat was so dry. Let me tell you, I used that bar on EVERYTHING! Anyway, I thought you’d be tickled to hear that the lotion bar saved the day! INGREDIENTS Beeswax, Shea butter, Coconut oil, Avocado & Olive oil. We personally filter our beeswax thereby retaining the natural antiseptic healing properties and the sweet scent of honey. Our NEW .35 oz. flat container fits into any pocket and when swimming in fresh, pool or saltwater you can tuck them into your suit…the water will not damage product. These little life savers are fantastic for cold sores, chapped lips, tattoos and more…works fantastic to keep your skin from drying out while motorcycling, hiking, winter sports, bicycling….